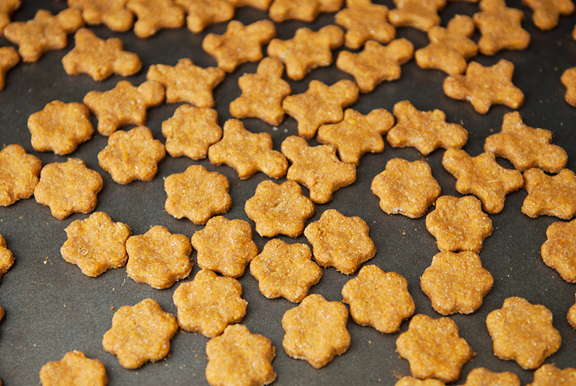 Before we brought Neva home, I made a batch of pumpkin peanut butter dog treats and cut them into little squares for her to eat and train on. I guess I was still in Kaweah-mode because the first time I handed a treat to Neva, she mouthed it for ten minutes then eventually spat it out because she couldn’t bite into it. In fact, she was so little and silly, she’d munch on a puppy kibble for a good ten seconds which translated into long dinner times. I was sad because Kaweah loved those treats so much and Neva didn’t seem to care for them at all. Little did I know that she was just too baby to eat them. Eventually, after her big girl teeth came in, she went after them with gusto. It’s been nice to feed her homemade treats because it’s more economical and doesn’t contain additives or artificial junk. I thought Neva could use some variety in her snacks and began to research diffent flavors and recipes. Because she is a labrador retriever, I don’t have to worry about her being picky. She’ll eat anything. I do want to make the recipes simple and keep the ingredients wholesome – organic when possible. The first variation I tried was chicken and sweet potato. These came out a little denser than I wanted, so my second batch had shredded cheddar cheese added to the dough. The cheese has a nice effect of creating rough layers sort of the way butter does in pastry dough. So even though the cheese isn’t in any of the photos, I do recommend adding it to the dough for a better texture that is less likely to break your dog’s teeth. And of course, she loves the flavor. Here is a video I posted on Instagram of her latest trick using one of these treats. 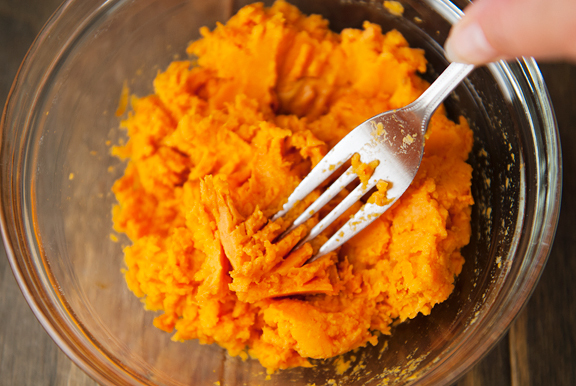 I’ve seen canned organic sweet potato purée in the grocery store and figure that would work too, although it might be wetter than your own sweet potato mash. Plus, I welcome a little texture in her dog treats so I don’t mash it completely. I think you could also get away with canned chicken if you didn’t want to cook your own, but those tend to be higher in sodium, which Neva doesn’t need. I just dropped organic chicken breasts in boiling water until they were cooked through. Note: Since this post, I’ve made this recipe a bazillion times and I prefer to roast the chicken breasts in a 375°F oven without seasonings or oil for 30 minutes, then turn the heat off and let them sit another 30 minutes. Then I pulse the slices in a food processor. These tend to have less moisture, which I think handles better in the dough. 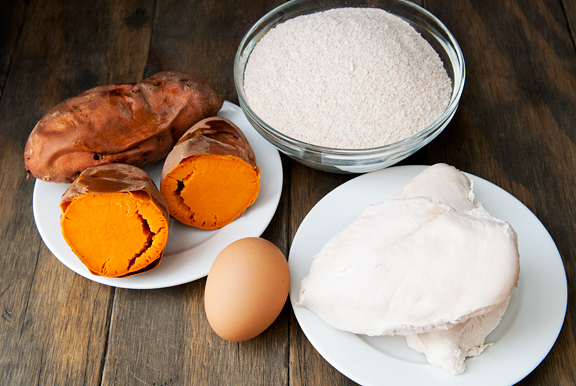 This recipe calls for one egg, but I realize that the moisture of the dough will depend entirely on how much moisture is in your chicken and sweet potato. 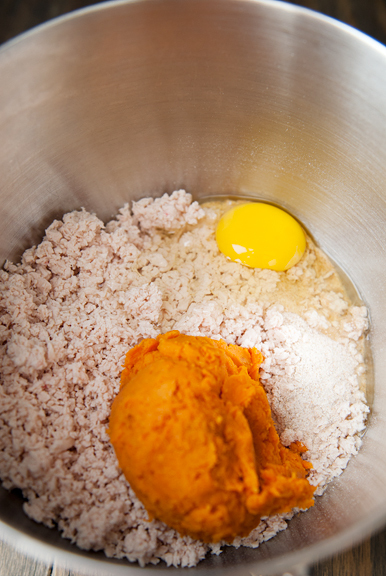 So if the dough winds up dry and unable to stick together, add another egg to help bind the dough. Be careful not to roll the treats too thin or they will burn. My test for doneness is when the centers give slightly under my finger when I poke them. Then I shut off the oven and leave them in with the oven door closed until they are hard or when the residual heat has completely dissipated (i.e. cooled). I don’t make chewy treats because I think crunchy treats are better for helping to clean Neva’s teeth. 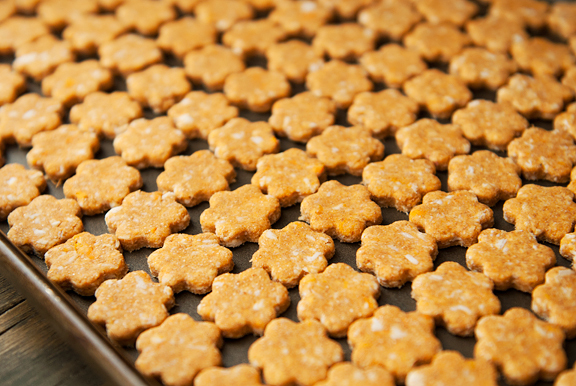 If you do make chewy treats, remove them from the oven to cool after they reach the soft-poke stage, and store them appropriately to avoid mold and spoilage. 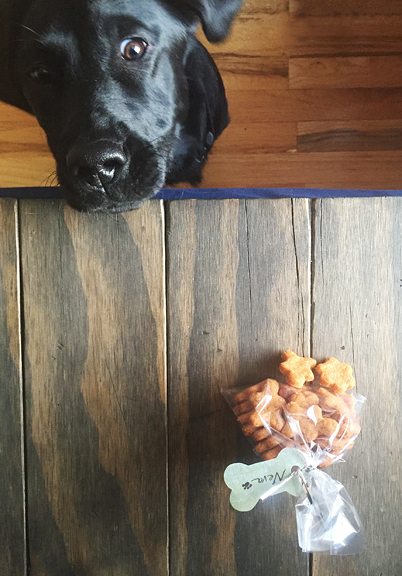 I mean, chewy cookies don’t last forever on your counter, so why would chewy dog treats? Neva loves her new treats. I think she likes eating the little people shapes more than the flowers – ha! Notes: I used to boil the chicken breasts in water, but I now prefer roasting the chicken in a 375°F oven for 30 minutes, then shut off the heat and let sit another 30 minutes. I baked the sweet potatoes in a 375°F oven for an hour. 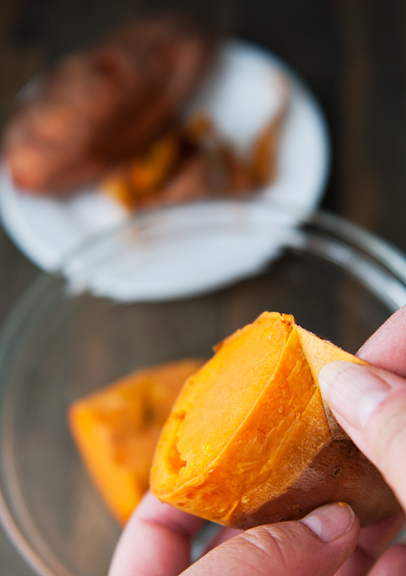 Just poke the sweet potatoes all over with a fork, then set them directly on the oven rack in the middle of the oven. Place a sheet of foil at the bottom of the oven (or on the lowest rack – just not directly under the sweet potatoes) to catch the drips. Preheat oven to 350°F. 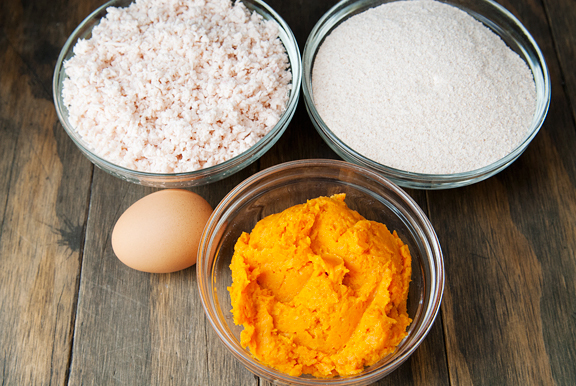 Mix all of the ingredients together until the dough is well blended. 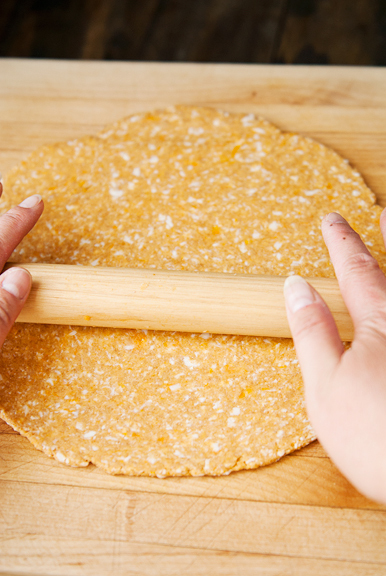 Roll the dough out on a lightly floured work surface to 1/4-inch thickness. 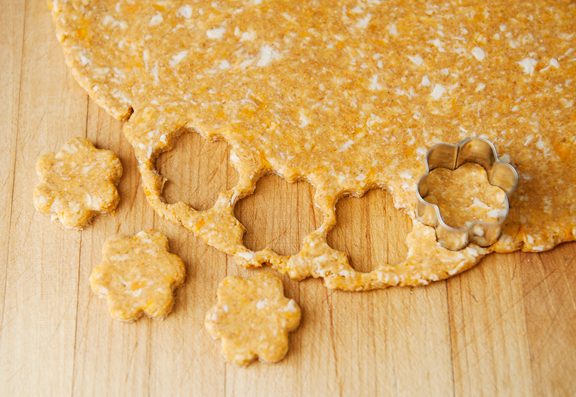 Cut out shapes and arrange on a foil- or parchment-lined baking sheet. Bake time will depend on size of the treats. For 1-inch diameter treats, start testing doneness after 15 minutes by lightly poking the center of a treat with your finger. For larger treats, allow for more baking time (but keep an eye on it the first time around). 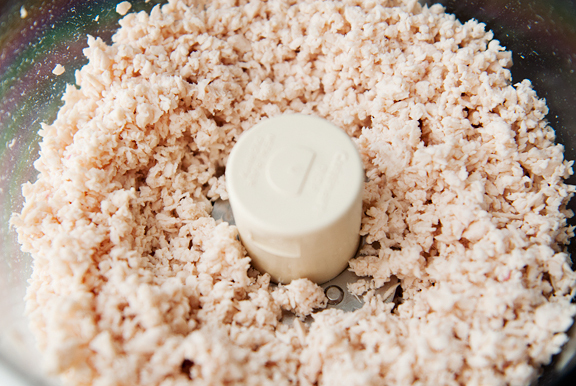 Treats should be slightly soft in the middle at which point you can remove them for soft treats. For crunchy treats, shut off the heat and leave the oven door closed. Let the treats dry out in the residual heat, but check to see that they aren’t burning at the edges. Store soft treats in a sealed container in the refrigerator for up to a week. 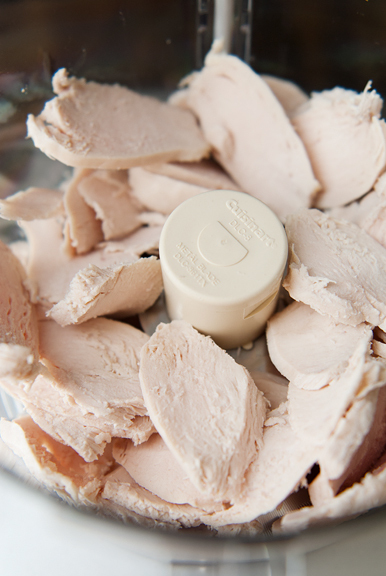 Store hard treats in an air-tight container for up to a week. If storing for longer, refrigerate or freeze them. Makes 100+ 1-inch treats. I will have to try this recipe for my Granddog, Lily. Right now I make treats with (among other things) a can of pumpkin & peanut butter. I store them in the freezer, because in Florida, even though they are crisp to start with, it is humid most of the year. Lily always looks forward to a visit with Gramma! I love reading about Neva. 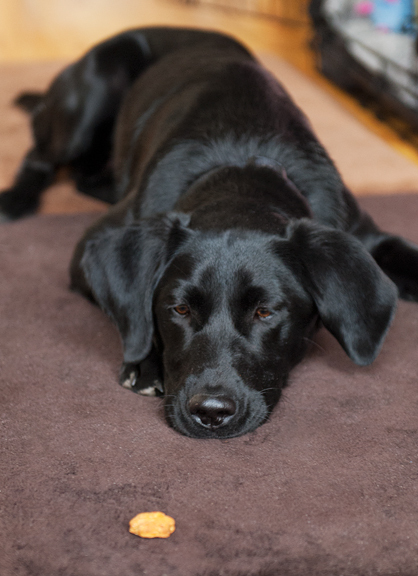 At one time I had a black lab and they are the best! I also enjoy reading about your snow & seeing your lovely pictures. Have a wonderful Thanksgiving. I love this!! Can you share more doggie recipes? Thank you! She’s brilliant! What a good doggie! As always, your photos are beautiful…and the little tiny treats, neatly organized on the sheet….so JenYu! This is so clever! My dog is quite picky about his treats (sometimes he just collects them and leaves them in a corner without even taking a bite) so hopefully this will be something he’ll be interested in. Awwwww, she is so sweet! https://en.wikipedia.org/wiki/2007_pet_food_recalls. Maybe you’re interested. I did not know about that scandal and I was shocked when reading about it the other day. … sorry: poison & poisoning. These look great! Do you think subbing oat flour would work?? 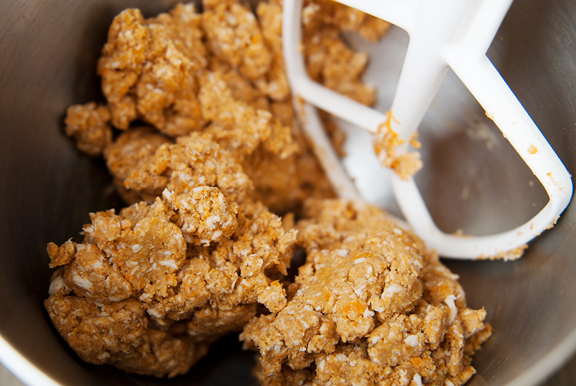 Jenny – I’ve never used oat flour before, so I don’t know. You could test a small batch to see how it turns out? 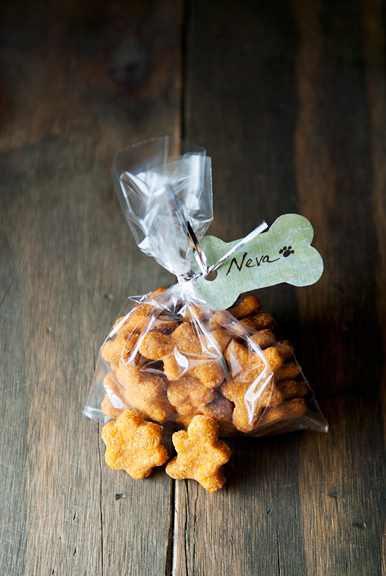 It was strange seeing my name on a bag of dog treats! May I ask where you got it from? I was named after my grandmother. Can you tell me how this dough is supposed to feel? I just made it amd it felt firm yet tacky, left residue all over my hands when touched and would not roll out with out splitting and tearing. Vanessa – If it is leaving residue on your hands, it may be a little too wet. Try dusting hands and work surface with some flour (but not too much). I find it easier to cut the dough into 2 halves and work each half separately when rolling out. It does split at the ends, but I just mash those parts together and re-roll them out. It shouldn’t have problems sticking to itself. If it’s falling apart, then it’s too dry (although if leaving residue on your hands, it can’t be all that dry). 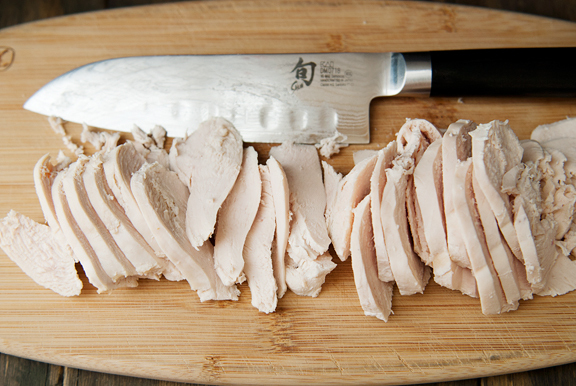 When you say 9oz cooked chicken how many oz is that in raw chicken? Vanessa – I’d guess around 12 oz. of raw chicken. I think you’re okay with anywhere from 8-10 oz. of cooked chicken. This recipe has some wiggle room.